The way water has carved through the rocks in the Hamersley Range has created an interesting variety of gorges. 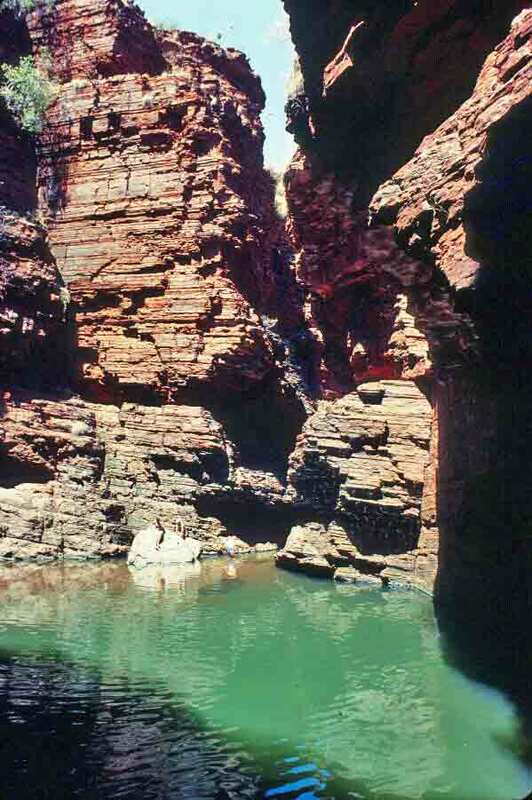 Some, such as Wittenoom Gorge and Yampire Gorge, are wide and have broken out of the side of the great land mass, making them accessible by road. Most, however, have carved down through the rock in such a way that you can only reach them by driving on top of the range and climbing down into the gorge from the top—though of course you can simply admire them from the ledge, if you don’t fancy climbing. This was true of Dales Gorge, which we’d seen previously, and of Weano Gorge, which we reached next. Weano Gorge is a relatively easy gorge to climb into. There are places where the walls are steep and slick, but there are also wider areas where the walls are rough, with good hand-holds, and a narrow sort of path that the many visitors have worn in one rock wall at one point. It was at this point that we scrambled down into the gorge. While the wider section of the gorge look more impressive from above, the narrower parts of the gorge are far more wonderful when you’re at the bottom. The narrowest part seemed magically secretive, like a hidden entrance to a lost kingdom. And it does lead to something that might be considered a treasure in this arid land—water. The first photo was taken within the narrowest part; the second picture shows where the gorge widens again and the path drops off into a pool. There are people sitting on the large rock at the far side of the pool, to give you something by which to gauge size. Wittenoom was named for one of the locals—Frank Wittenoom. It was given this name by Frank’s partner at a nearby station, Lang Hancock, for whom Hancock Gorge is named. Today, only a handful of people remain in Wittenoom, though it was close to being a ghost town even when we visited it. The nearby asbestos mine has been closed, but the abundance of asbestos nearby is thought to make the whole place a health hazard. But the setting is beautiful, and not everyone has been able to tear themselves away. As I noted in the book, the wilderness pretty much starts across the street from the little town. The leading edge of the Hamersley Range rises in the very near distance. The area is known for the abundance of minerals, including many gem stones, and we had walked to the edge of town to visit a local rock shop. The mineral samples were spectacular, but far too large to be lugging around in one’s suitcase for several months, so I escaped without succumbing to that temptation. When we left the shop, the changing light playing across the land caught my attention. I stood on the curb and watched twilight begin to creep across the desert. Soon, it was too dark to take pictures, but the light continued to paint sky and earth in changing pastel hues. I was delighted. 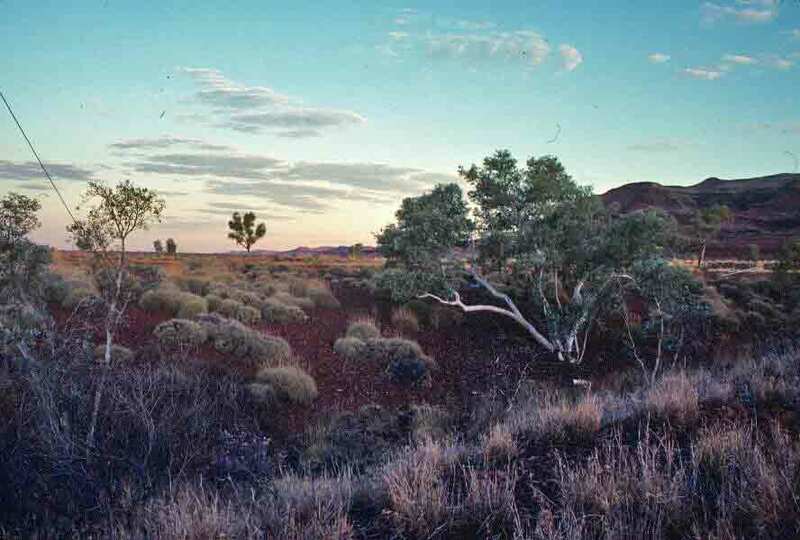 The photo below is of the view from that curb in Wittenoom, at the beginning of the twilight light show. If you know anything about plate tectonics, you know that the surface of the planet is not static. It is, rather, in constant, if slow, motion, with continents moving, seas opening and closing—and earthquakes and volcanoes along the edges where the plates meet. Over the ages, land has been repositioned, created, destroyed, pushed under, and pushed up. For example, the Indian subcontinent is on a different tectonic plate than the rest of Asia, and it is the crashing of the Indian plate into the Asian plate that has pushed, and continues to push, the Himalayas skyward. The forces at work in plate tectonics are immense. And it was these forces that created some of what we were seeing in the Hamersley Range. The range itself is actually a plateau that was pushed up millions of years ago, and has since then been formed by erosion. 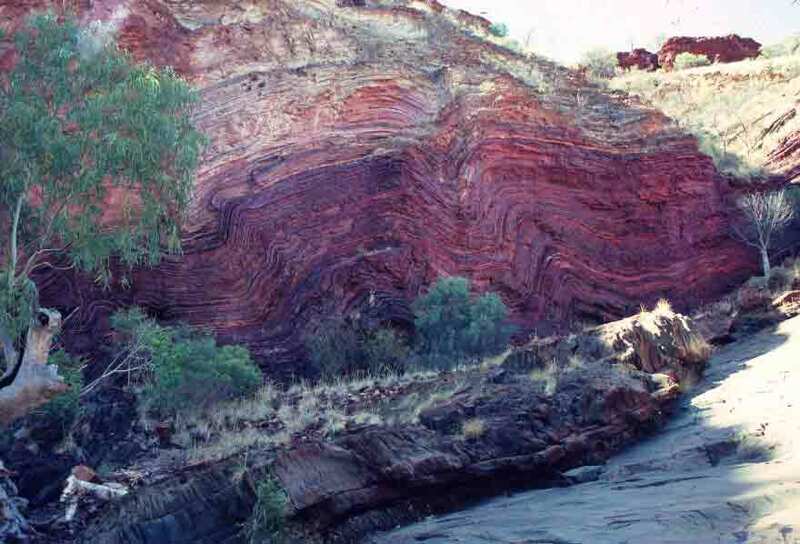 But signs of the tremendous pressure involved in that pushing are still evident—most dramatically at Hamersley Gorge, where one can see massive, layered bands of ancient rock that have been bent like ribbons of soft clay. The same forces that create earthquakes in Japan, volcanic eruptions in the Andes, and the growth of the Rocky Mountains created the waves and bends in the walls of Hamersley Gorge. I picked the image below, not because it showed the largest or tallest bending and bowing of the rocks, but because it shows it so clearly. The region through which we were now traveling is called the Pilbara. 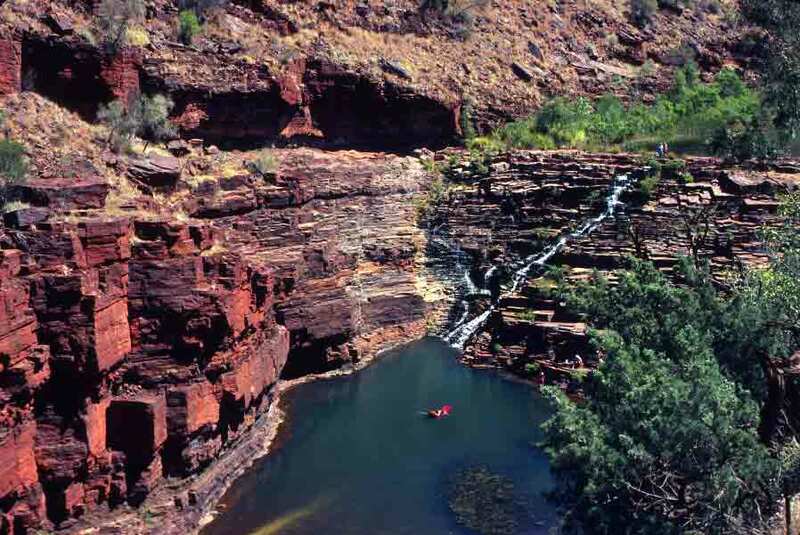 The Pilbara is a large (197,000 square miles), rugged, and remote region of northwestern Western Australia where both the Hamersley and Chichester Ranges are located. It is arid and can be on the warm side. 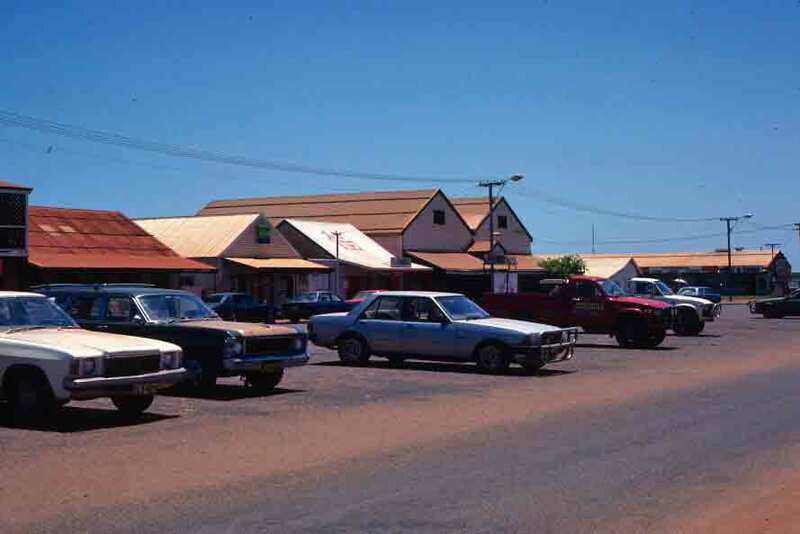 In fact, Marble Bar, a town in the Pilbara, is famous as one of Australia’s hottest spots, with daytime temperatures from October to May often exceeding 120 degrees Fahrenheit. Most of the settlement in the Pilbara revolves around mining (minerals found in the area include gold, tin, copper, talc, iron, manganese, magnesium, silver, beryllium, columbite, asbestos, and tantalite). However, the remarkable geology, ecology, remoteness, and beauty of the place draw a fair number of tourists to the region, as well. We were there to enjoy the area’s geological and scenic delights—and the Pilbara did not disappoint. 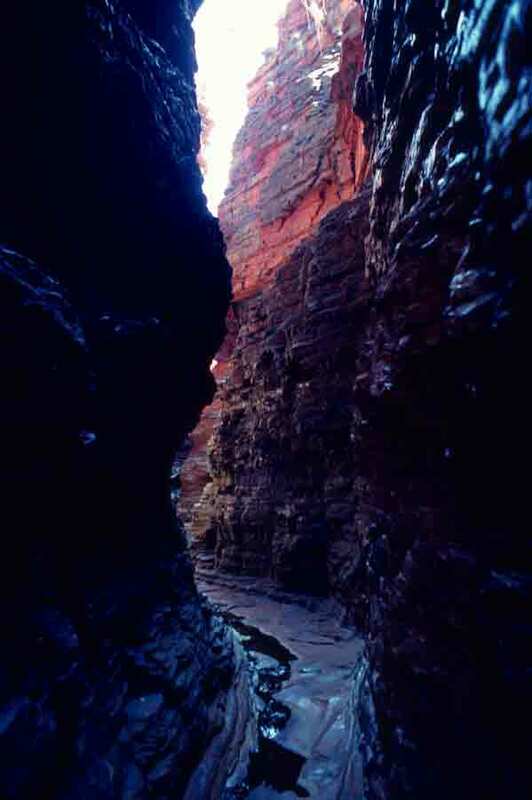 The Hamersley Range is thought to have been the first part of the earth’s crust to cool. It is wildly colorful, thanks to the wide range of minerals, but red is the color that predominates. It is the many gorges that cut through the range that are the biggest attraction for adventurers and photographers, though I found the surrounding spinifex-dotted landscape to be mighty pleasing as well. Dales Gorge was the second gorge we visited, and the first where one had to climb down into the gorge. We started at the end of the gorge were Fortescue Falls cascades down a series of stone “steps” into clear pools on the gorge floor. This waterfall is remarkable for this region because it flows year-round. I loved the sight of the waterfall (as I’ve mentioned elsewhere, I have a great fondness for falling water), but at this spot, I was even more captivated by the rocks. The colors were remarkable, but so were the shapes. I loved the way the stone walls looked in places as if they had been carefully cut, rather than simply worn and broken. The photo below, taken when I was about half way down the gorge wall, shows both a portion of the lovely falls and some of the surprising rock shapes that delighted me. A long day of driving carried us from Broome to Port Hedland. The town was small enough, with a lovely location on the ocean, and it catered to my particular addiction to sea shells (bought three lovely ones), but it fell short of charming me because it was also the location of a great deal of large machinery. It has huge operations for loading iron ore onto ships, and it is also home to important sea salt manufacturing and processing facilities. However, while I was more in a wilderness frame of mind, my interest in how things are made at least made the spot intriguing—particularly the sea salt facilities. 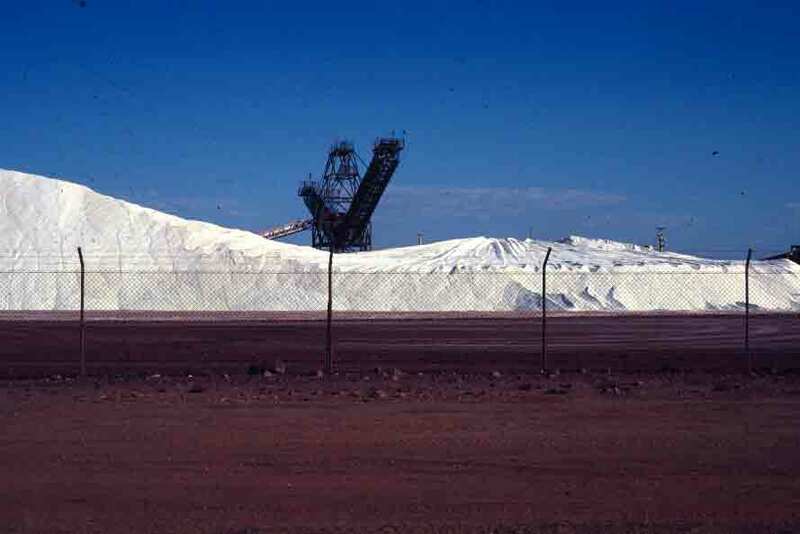 In Port Hedland, I wandered over to get a view of the salt pans and mountains of salt ready for processing. I would be glad to leave this place the next day, and get back to the wilderness, but I was pleased to have seen the salt operation. The photo below (the one that also appears in the Hungry Magazine article) is of sea salt ready to be processed for distribution. When I first visited Broome, it was a wonderfully rustic and yet still vaguely exotic place with multi-lingual street signs that reflected the multi-ethnic population. There was no landscaping other than what nature provided. Shops tended to be either Asian-run, incense-scented establishments with fans turning lazily overhead or open-air venues where barefooted and often shirtless artisans cranked out trinkets made from local materials, most notably sea shells, with particular emphasis on mother-of-pearl. On my third trip to Australia, as I made my way across the top of Western Australia, I told my traveling companions about what a fun, funky place Broome was, and I looked forward to seeing it again. Ooops. Well, not everything was altered. The low-slung architectural style of Broome had been preserved, and the town’s movie theater still consisted of a bunch of lawn chairs in the open air, but things had definitely changed. The pearl business was booming, and elegant stores offered Broome’s huge, white pearls in stunning settings, all presented by skilled and well-dressed sales personnel. The streets were beautifully landscaped. There were day spas and nail salons. The lunch room was serving quiche. What had happened? Well, what had happened was someone figured out that a place with miles and miles of pristine beaches and a couple hundred days of sunlight each year might be a nice place for a resort. The resort was built, and Broome went upscale. All very attractive and probably much nicer for the locals (at least some of them), but a huge disappointment for those of us who fancied the more rustic Broome. The photo on the left is Carnarvon Street the first time I saw it. 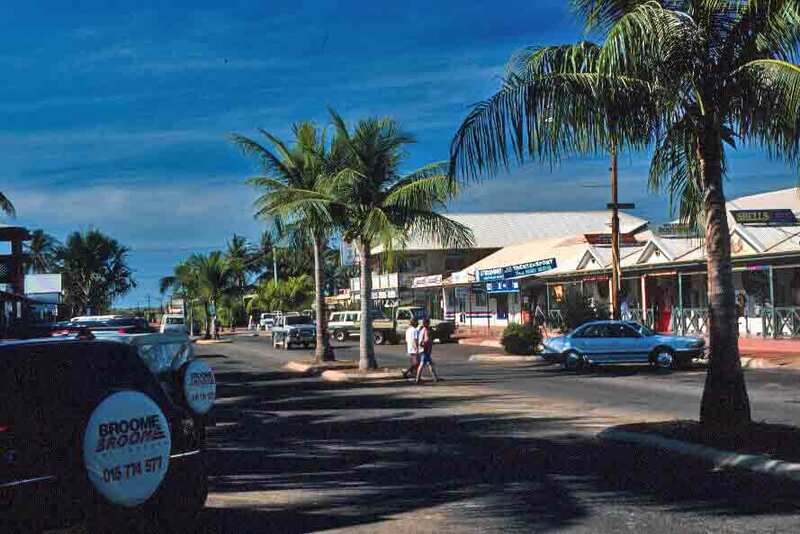 The photo on the right is the same street the second time I visited Broome. Fortunately, the wild rugged areas are still close by, and the surrounding area is considered one of the world’s great birding sites—a feature we enjoyed very much on that second visit.